Like a lunar eclipse, the design of these earrings is captivating. 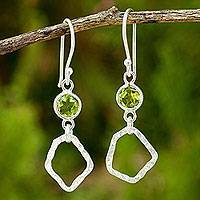 From Aoy in Thailand, the sterling silver earrings feature a hammered, polished finish. Peru's Marina Guzman creates the fabulous design of these earrings. Crafted by hand of sterling silver, the hammered earrings feature burnished leaves. Patterned by a hammered finish, two crescents are crafted of silver by Karen hill tribe artisans in Thailand. Chanatip Na Lampoon designs these elegant hoop earrings. 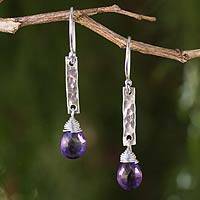 Featuring a patterned, hammered finish, two slits are crafted of sterling silver in this modern pair of dangle earrings from Peru. Marina Guzman designs these fascinating earrings. 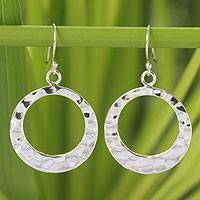 Crafted by hand of sterling silver with a hammered finish, four beautiful circles dangle. Peruvian artisan Silvia Garcia designs these modern earrings. Crafted by hand of sterling silver with a hammered finish, two half-hoops curl below the ears. Peruvian artisan Silvia Garcia designs these earrings that gleam in the light. Handcrafted of sterling silver and given a hammered finish, two peaceful doves dangle. Putu Putri presents these dangle earrings, crafted by Balinese artisans. Size: 2.1" H x 0.5" Diam.